The Robinson R44 Raven is a light four-seat utility helicopter powered by a single carburetted Lycoming O-540-F1B5 piston engine. The Robinson R44 is built and developed by the Robinson Helicopter Company in Torrance, California. Design of the Model R44 began in 1985. The first prototype flew on 31 March 1990 and the second in January 1991. Sales efforts got under way in March 1992 at a base price of 235.000 US-Dollars. FAA Type Certification for the R44 Astro was achieved on 10 December 1992, and the first Robinson R44 Astro was delivered in February 1993. In 2000, the R44 Astro was replaced as the main production model by the hydraulically-assisted R44 Raven. Today the four-seat Model R44 is the world's most popular helicopter with over 6300 delivered to customers all over the world. The ICAO Aircraft Type Designator for the R44 Raven helicopters is R44. On 12 February 2002, Robinson R44 Raven c/n 1157 was registered G-LNDS in the UK with Heli Air, Warwick. On 27 March 2002, the G-LNDS was registered with Mc Air, Solihull. On 23 April 2004, registration G-LNDS was cancelled as exported to the Netherlands. On 1 May 2003, the Robinson Raven was registered PH-WJK in the Netherlands with Coolen-Huybregst, Heythuysen, as owner and Helicon, Lelystad as holder. On 26 April 2004, was registration PH-WJK cancelled. On 12 May 2004, the helicopter was registered N318DD in the USA with Bogco Aviation Inc., Wilwington, Delaware. However registered in the USA, the helicopter remained in the Netherlands. On 1 August 2005, registration N318DD was cancelled as exported to the Netherlands. On 5 August 2005, the Robinson Raven was registration PH-WJK was restored with A. Jansen Beheer, Kootwijkerbroek. The PH-WJK was operated with the JAKO logo, which stands for Jansen Kootwijkerbroek. On 25 September 2015, registration PH-WJK was cancelled as the CofA was over a year expired. 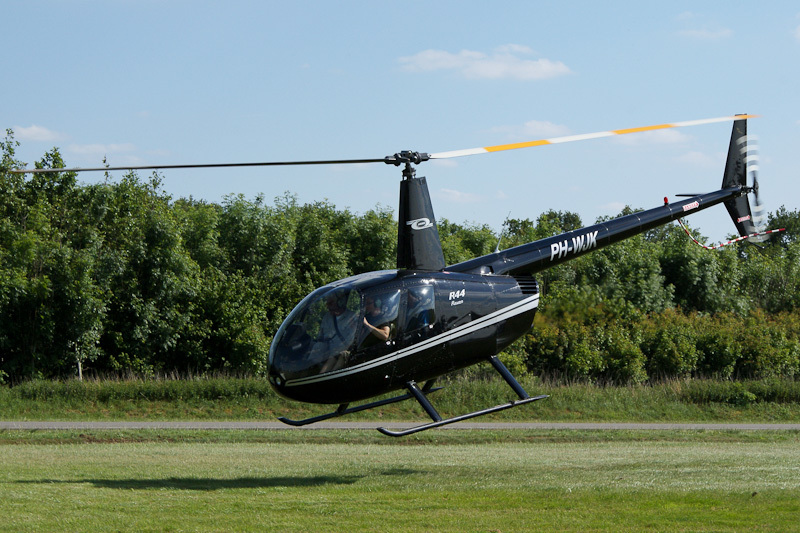 On 26 June 2010, during the 80th Dutch TT, the 2002-built Robinson R-44 Raven PH-WJK was seen in service with JAKO at the helipad of the "Circuit van Drenthe" near Assen, the Netherlands.